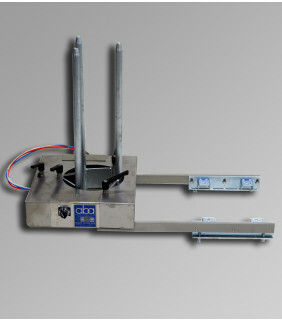 The ABA-LDHS lid dropper unit is a high speed lid dropper for metal and plastic lids which mounts to all ABA lid press units and can drop lids from 1/2 pint through 1 gallon. ABA lid placers are designed for lids with a diameter larger than 7 inches (178mm) Lids are pre-loaded onto a chute and placed on the containers as they pass underneath. The mechanical escapement system uses the pressure of the containers to align and release the lids in one smooth and simple operation. ABA lid droppers are designed for lids with a diameter less than 7 inches (178mm). Lids are pre-loaded into the hopper and dropped onto containers as they pass underneath.